2009 Toyota Avalon - The car is spacious and appears expensive. This was the first car that I owned. I like the spacious back. It is extra long. I like that the car itself looks expensive but we only bought it for 6,000. The seats are leather which I both liked, and disliked. They are great for easy clean-up, if there are any spills. However, they are terrible during hot weather. The seats get incredibly hot, and the steering wheel as well. I also disliked that the seats are very slippery. In the backseat, during turns, I felt like I would slip out of my seat belt. I like that the seats have automatic adjustments. I appreciate the bigger seats. I also like that there is extra room for leg space. I like the dashboard gadgets. Everything looks very modern and up to date, yet it maintains this vintage feel. When I drive in the car, I feel like I am in old Mafia movies. My vehicle is grey and has a brown interior. The carpets are also, very easy to clean if there are food crumbles or dirt. I take my dogs with me to a lot of places, and found that in this particular car, it was easy to remove all the dog fur. A memorable story that I had using this vehicle was the test run at the dealers. The car dealer told me to swerve the car left and right on this empty straight street to show me how much control I would still have. It was a lot of fun because, it was at that moment, that I knew this car was meant for me. The top positive things about this vehicle has definitely got to be the appearance. I get many compliments about this car from family members and friends. They think that the car was expensive. However, I did get it used, so that cost may have been a lot more expensive then what I paid for. My favorite features of the vehicle is the seat warmers for cold days, the opening from the back through the back seats. It makes it easy for my passengers to grab things that we stored in the back while we are on a road trip. I like the brown lining, and grey floors and seats. The seat belts never lock. I think that the extra large back compartment is a really huge plus because I travel a lot, so the bigger the back, the less I have to worry about if my belongings will fit. I like that each passenger gets a cup holder and that the back has a regular outlet so that we could all charge our phones. I also really like that the rear mirror is extra wide to provide me more room to see my blind spots. There were not many cons for this vehicle. I may have a bias because this is my first car. However, If I were to have to name a few cons then it would be that the top lining of the car in the inside was slowing coming off. I bought it that way and I have tried to push it back into place, but once it is out, it will stay out. I also dislike how hot the car gets because of the leather. The paint of the car comes off easily. It was slightly grazed by a bike and its paint was easily scratched off. It also gets dented pretty easily. My brother closed the garage on it and it like a small dent. The seats are also kind of low. When I have to drive my grandfather out to place, he has a hard time getting in and out of the car. I also think that the cup holders for the front passengers are a little bit wobbly so I do not trust them. Also they are too small for most of my cups. Also, the flaps behind the driver and front passenger seats that allow someone to put things inside stretches out way to easy. I put a couple of books inside, and when I took them out, it looks like they are still holding books inside. The 97 Toyota Avalon is exactly what you'd expect in a late 90s four door sedan from Toyota. Nothing too flashy, nothing too special. But everything is highly efficient, highly functional, highly intuitive, well-designed, and built to last. 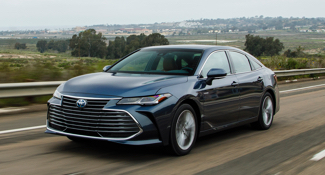 It includes all the features you would expect in a mid-tier sedan, including power windows, power locks, power sunroof, working A/C, leather seats, power seats in passenger and driver seat. Trunk is spacious that's able, for me, to fit over 10 desktop computers in and several hundred pounds of scrap metal, which gives you an idea of the build quality and materials of this fine vehicle. The car has enough power for you to overtake people on the highway with ease, with it's DOHC V6 engine with 205 HP. However it still runs an efficient 25 mpg when cruising on the highway and a great 20 mpg when going for a drive around the city. I bought the car at 136,000 miles, and have driven it approximately 20,000 miles since then. It was performed admirably the entire time, and I believe the car will last me several more years if not longer before I finally have to part ways with it. But I could never see myself selling it because it no longer works, but only because I'd want to purchase something more modern. This is a 200,000-300,000 miles car for sure. I lived out of my car for a few weeks while I was couch-surfing/looking for a place to live. 1995 Toyota Avalon - Dependable, not stylish. My vehicle is almost as old as I am, but it is very dependable and gets the job done. I like that it has not broken down on me ever, I like that it is very spacious on the inside, and I like that it has automatic windows and a sunroof. I do not like the look of the car. It is extremely long for my liking, has a weird maroon color, and has a strange "chrome" lining around the wheels and door handles. It runs very smoothly, but does not get the best gas mileage. It takes approximately $35 to fill the gas take each time, which is way more than I'd like for this car. I do not like the leather seats as much as I thought I would, but they do they're work I suppose. The car was so old when I got it that I had to install a new radio and replace the A/C, but other than that no real major problems with the car. The car is starting to fall apart internally, such that the "coverings" on the interior door fall off as well as the light cover. The speakers are starting to go out, but overall it is still running and for the price of $0 a month it does just fine. The best thing about the car is that I own it and do not have to pay a monthly payment on it. Yes it is not aesthetically pleasing to the eye, and what I consider a "grandma car," it is very reliable and has not let me down just yet. When I packed up my entire dorm room into my car in one trip. No one believed that I could do it and I kept thinking they don't realize how big my car is. To everyone's surprise I was able to so easily! My favorite things about my car is how reliable it is. I know that I can trust my car to get me to where I need to go. When I first bought the car it only has 42,000 miles on it and I just hit 100,000 within the last 6 months. It has gotten me to so many places without any worries or problems. The next top positive thing about my car is the space on the inside and the trunk size. My car is huge, therefore I have plenty of space in the backseat and the trunk area. I was able to move an entire dorm room in my car, in one trip! I can surprise people with how much I can fit in my backseat and trunk. The next best thing about my car would be the sunroof. Even though I do not use this sunroof a lot, I do appreciate that it is there when I do want to use it. I do love that this car is old, I have had other people comment on how good the condition is and how it is a "nice" car to have. Because it is Toyota people tell me all the time that it is a good car and that it will last me a lifetime. I think that this car is a gem, but it is just getting really old. It is very reliable and has treated me good over the past 7 years that I have owned it. I also commend the previous owners for keeping it in really good shape and not using up all the miles that it has to offer. The look of the car is the top negative thing about this car. I do call it my "grandma car" because it is huge and not aesthetically pleasing to the eye. I feel that it does not match my look or my age. The interior pieces are starting to fall off and peel off. The light coverings as well as the door handle coverings are falling off and are difficulty to keep on. The leather seats are peeling as well as the interior paneling. The other negative thing about this car is the gas mileage and gas tank size. The tank is 16 gallons and take around $35 to fill up EACH time, and the gas mileage is not the best. I do not like that it is not environmentally friendly, in that it is not a hybrid. I think that I would appreciate it more if the car was a hybrid and a little nicer to the environment. The next negative thing about this car is that there is not a windshield wiper on the back window and it is difficult to see out of the car when it is raining. I feel that the windows attract water and even if I roll them down it does not get the water off, making it difficult to see. The inside of the windows also get extremely dirty even when I do not touch them. It makes it very difficult to see outside.